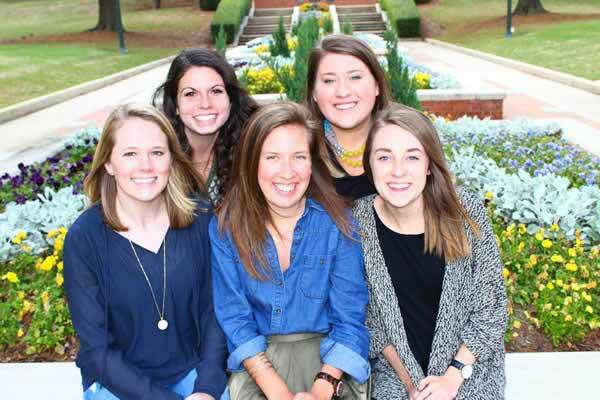 A Samford University team is a finalist in the Public Relations Student Society of America’s (PRSSA) 2016 Bateman Case Study Competition. The Samford team of Emily Duval of Nashville, Tennessee, Allie Haywood of Vestavia Hills, Alabama, Lauren Hutchens of Boca Raton, Florida, Kathleen Sharp of Boca Raton, Florida, and Paige Shelby of Franklin, Tennessee, will join teams from the University of Alabama and Loyola University in Chicago May 18 for presentation of their projects and final judging. Annually, the Bateman Case Study Competition challenges teams of college students on their ability to develop and present a comprehensive public relations campaign. Two of the main goals of this year’s Bateman Competition were to raise campus and community awareness about Student Veterans of America (SVA) and its programs, and to make student veterans and their families informed consumers of their GI Bill benefits. Seventy teams from across the country developed strategies to support SVA in its mission to share student veteran information around the globe, as well as to increase the support and networks for these deserving individuals. Each team was then judged on the research, creation, implementation, evaluation and measurement of their public relations campaign on behalf of SVA. Emmons and PRSSA adviser Philip Poole (Marketing and Communication) will travel with the team to the competition in Chicago.